Welcome to our complete guide to the best dog beds for Labs. Whether your lovely Lab is still a pup or is a full-grown senior in his fall years, it’s important to find the right size bed for your pet’s needs. We’ll begin by looking at what size bed is most suitable, then review some of the best dog beds for Labs. In this guide, we’ll help you to find the very best Labrador bed for your pampered pooch. We’ve looked at a wide range of dog beds for Labs to suit every budget and home décor scheme. A few outdoor beds are included to accommodate the outdoorsy Lab, who loves fresh air and sleeping under the stars! What Labrador dog bed size is the right size? When it comes to choosing the bed for your Labrador, the assumption that “one size fits all” is not necessarily accurate. There’s a wide variety of different fillings and styles of dog beds to choose from, and every dog’s requirements are slightly different. Generally speaking, when considering what size dog bed for Labrador, you will be looking at beds for “large dogs”. These beds are designed to accommodate dogs that weigh between 70 lbs and 90 lbs. 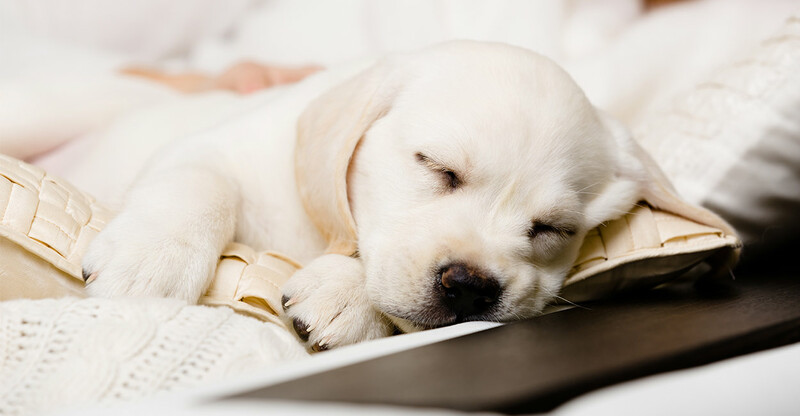 If you choose a bed for your Lab that’s too small, he may flatten the filling on the first night he spends in his new bed, risking pressure sores and an uncomfortable night’s sleep! On the other hand, a bed that’s too big may allow drafts to penetrate, leaving your pet shivering on cold nights. Some Labs enjoy stretching out in their beds, while others prefer to curl up in a ball. So, consider your pet’s sleeping preferences when looking for a suitable Labrador retriever bed. Labradors are prone to a congenital condition called hip and elbow dysplasia. They can also suffer from osteoarthritis in later years. Labs can also develop pressure sores on their elbows and hocks if the padding in their bed is not thick enough. Memory foam beds can be good dog beds for Labs who have any of these conditions. Senior dogs and puppies can also have issues with toilet training and occasional “accidents” may occur. A washable dog bed for Labrador retriever is the perfect solution for this problem. Labrador puppies love to chew! For this reason, it’s best to choose a bed that can be washed and that is made of tough stuff. Lab pups also grow quickly, so be sure to select a bed that will last longer than a couple of weeks. So, without further ado, let’s have a look at the best pet beds for Labs! Pet Support Systems Dog Beds – Orthopedic Memory Foam – 100% Made in USA – Luxury Large Breed Washable Pet Bed. Labradors with joint problems and those that are overweight will benefit from this medical grade, orthopedic memory foam dog bed. The 4” thick mattress comes with a 3 year materials warranty. The bed features a water-resistant liner and an easy-remove washable cover. First-Quality Orthopedic Dog Bed. In addition to your dog’s comfort, this dog bed is designed to fit neatly into small spaces. The bed is made from premium memory foam and is perfect for senior Labs with arthritis or hip dysplasia problems. The bed has a removable washable cover. Papa Pet Orthopedic Dog Bed. This dog bed is made from solid, human-grade memory foam to provide a comfortable night’s sleep for your pet and to give relief from the pain of arthritis and hip dysplasia. The bed has a stylish, removable suede cover and a fully waterproof lining. In addition, all the materials used to make this bed are endorsed by the manufacturer as “chew proof”. Some Labradors are just big softies! They love nothing more than to snuggle into a cuddle-up bed for a good night’s sleep, where cold drafts can’t reach them. Have a look at these cosy options for your pup. Best Friends by Sheri Luxury Shag Faux Fur Donut Cuddler. These lovely, donut-shaped snuggly beds are perfect for the Lab who loves to cuddle-up. The beds are self-warming and have a raised rim for head and neck support. A super-soft filling offers relief to stiff joints. The beds come in a wide range of attractive natural colors to blend with any décor scheme. The bottom fabric is water and dirt resistant to prevent accidents from reaching your floors. Snoozer Luxury Cozy Cave Pet Bed. This luxury cave bed has a Sherpa lining for added warmth in winter and has a cooling effect in summer. The removable cover is washable and is made of luxury micro-suede, which comes in a wide variety of subtle colors to perfectly fit whatever your style. Friends Forever Premium Orthopedic Dog Bed. This cushioned plush poly-fill bed offers a surrounding bolster to provide head, neck, and hip support and to keep out drafts while offering supreme comfort, even for arthritic dogs. The liner is water-resistant and the orthopedic mattress is made from human-grade foam. The removable zippered cover is washable, and the bottom of the bed is made of non-slip, water-resistant material. If your pooch likes to climb onto your sofa and hog the whole thing, why not buy him his very own? There are lots of sofa-style dog beds for Labradors that blend well with interior decoration schemes too, so your dog’s personal sofa will fit in seamlessly with your own furniture. Keet Fluffly Deluxe Pet Bed, Sofa. This bed is handmade with a strong wooden frame for durability. The fabric is wipe-clean leatherette. The bed’s cushion is made from shredded memory foam and covered with a luxurious, soft fabric. Keet Deluxe Orthopedic Memory Foam Dog Bed Set. This smart Labrador bed is made from a wooden frame that’s built to last. The cushion is made from orthopedic memory foam and is covered with a removable, zippered cushion that is stain-resistant and easy to clean. With this luxury Labrador bed, you also get free matching pillows, a mat and a toy for your pampered pet. If you appreciate accessories then this is definitely going to be a favorite for you in our best dog beds for Labs list! KOPEKS – Orthopedic Memory Foam Dog Bed With Pillow and Waterproof Liner. Perfect dog bed for Labrador retrievers with joint pain or arthritis issues, this orthopedic memory foam dog bed has a waterproof liner and a comfy pillow. The outer cover is made from soft, plush suede and has an anti-slip bottom zippered cover. If your Labrador likes to spend much of his time outside, especially during the warm summer months, you’ll need a comfortable outdoor bed for him. A portable outdoor bed can be taken with you on family days out and trips away too, so your pet will be comfy and catered for wherever you go! Outdoor beds need to be robust and weather-resistant, whilst also being comfortable and practically designed. Coolaroo Elevated Pet Bed with Knitted Fabric. The Coolaroo elevated pet bed has a clever off-the-ground design that increases airflow all around the bed, keeping your Lab cool on the hottest of days. The bed’s suspended platform gives extra comfort by making low-impact areas for arthritic joints and potential pressure points. The fabric is made from breathable material, which helps to rule out potentially uncomfortable hot spots. Built to last, the powder-coated steel bed frame is lightweight, easy to move, and fully portable. The cover is resistant to mold and mildew, fleas and mites. It’s also easy to wash and maintain making it a cool addition to the best dog beds for Labs. K&H Pet Products Original Pet Cot Elevated Pet Bed. K&H Pet Products offer a raised pet cot for the outdoor loving Labrador. The bed is made of strong, water resistant, 600 denier fabric, helping your pet to stay cool and dry with its mesh center. The bed frame comes as a simple, tool-free self-assembly kit and includes a one-year manufacturer’s limited warranty. To give your pet the full outdoor living experience, you could also invest in the K&H Pet Products Pet Cot Canopy to complement the bed. The K&H Pet Cot Canopy is the only one of its kind and is designed to fit perfectly with the pet cot. The Pet Cot Canopy helps keep your pet shaded from hot summer sun or from sudden showers. The canopy is light and portable, and is easy to install with no tools needed. To remove bird droppings and other dirt from the canopy, simply wipe it clean with a damp cloth. Labrador puppies grow very quickly and they also love to chew! This can make choosing a bed for your Labrador puppy rather tricky. After all, you don’t want to spend a fortune on a large, luxury dog bed, only to find that your pup eats it on his first night! All things considered, it’s usually best to buy a cheaper, smaller bed for your Labrador puppy. Once he’s grown out of the teething phase, you can upgrade his bed to a larger, more long-term option. Here are a few smaller, budget beds that we think would make ideal starter beds for your Labrador puppy. MidWest Deluxe Bolster Pet Bed for Dogs. Despite its budget price, this pet bed is ultra-soft and has a bolster surround to give your Labrador puppy plenty of comfy snuggle space. The bed can be used to line a pet crate or as a stand-alone bed. The whole bed is fully washable and comes with a one year manufacturer’s guarantee. TrustyPup Luxury Liner Pet Bed Deluxe Crate Liner. The TrustyPup pet bed can be used as a crate or kennel liner or as a deluxe stand-alone bed. The bed has a well-padded bolster surround to cushion and protect your Labrador puppy and is also fully washable. Both the beds featured above can also be used to line a plastic bed such as the one below. Marchioro Perla 3 Bed for Pets. The Marchioro Perla 3 pet bed is made from durable, chew-resistant plastic with a sculpted front to allow your puppy easy access. Slits are included to provide ventilation, preventing your pup from overheating. Non-slip feet prevent the bed from sliding around on tiled floors if your pup takes a running jump into it! Given the huge range of dog beds for Labradors that are available, finding the right one can be a time-consuming minefield and something of a challenge. Luckily, we have a timesaving system to share with you that will make finding the right bed for your Labrador a breeze! First of all, you must decide on your budget. Remember to include shipping costs if you are intending to order a Labrador bed online. Next, make a list of all the features you want your Labrador bed to have, for example, a waterproof cover, memory foam cushion etc. Now, place all those features in order of priority. Finally, take a highlighter pen and mark the TOP FIVE most important features in your list. Now you can use your carefully curated list to search online for the perfect bed for your Labrador! Why not share the story of your search for the perfect bed for your Labrador with us and other readers in the comments section below? And if you find the bed of your pooch’s dreams that isn’t already on our list, we really would love to hear about it!